This article in Rail Technology Magazine is entitled Greater Anglia to lobby government for investment in 10-point upgrade plea. Trowse swing bridge replacement with a double track fixed link. Long loops at Colchester and Witham to allow fast trains to pass slow ones. Digital re-signalling between Colchester and London. Capacity upgrade to allow four trains between Angel Road and Stratford. Four-tracking between Coppermill Junction and Broxbourne. Platform and concourse upgrade at Liverspool Street station. Should we call it ambitious, greedy or sensible? This has been requested for years, so I suspect it has been thought about for a long time. But the new East Anglia Franchise has plans that will affect the traffic through Haughley Junction. Three express trains per hour (tph) between Ipswich and Norwich – Up from 2 tph. 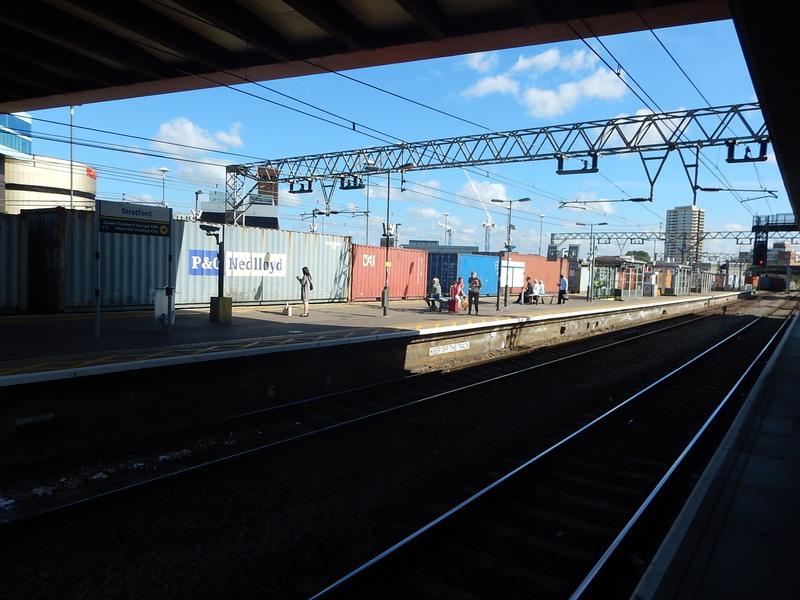 Two tph between Ipswich and Bury St. Edmunds – Up from three trains per two hours. To make matters worse, an increasing number of freight trains between Felixstowe and Peterborough will be going through the junction. This Google Map shows the junction. Stowmarket, Felixstowe and Ipswich are to the South. There is a handy level crossing where station road crosses the tracks. Diss and Norwich is to the North. Bury St. Edmunds, Cambridge and Peterborough are to the North West. You could naively think, that around the junction is nothing but farmland and a few trees, but the owners of |Tiptree Fram probably have lived three for decades. Going North, you have just stopped at Stowmarket station. But you can’t leave as Haughley Junction is blocked by one of the many long freight trains crossing the flat junction from the line to Peterborough to go South to Felixstowe. So bang goes your schedule! Going South, you have a similar problem, in that freight trains could delay progress, whilst they cross from the Peterborough Line. Freight trains and passenger trains joining the Peterborough line from the South, would appear to not cause such a large problem, as they just turn left without crossing any lines. In an ideal world, there probably needs to be a single-track flyover, so that trains from Peterborough to Stowmarket can cross the Norwich lines without delaying trains. A similar flyover at Hitchin cost £47million. So it wouldn’t be cheap and would the locals fight the construction of such a structure in the midst of Suffolk countryside to benefit commuters from Norfolk? A complete scheme would also add a loop line just to the West of Haugthley Junction, so that long freight trains could wait without getting in the way, until there was a suitable time to cross. I suspect, that to keep costs down and avoid annoying the natives, all that will happen at Haughley Junction is a limited scheme so that trains can wait before crossing. Over the last few years, Network Rail have developed some innovative junctions and crossings, so let’s hope that they come up with a scheme that’s efficient, affordable and can be built without closing either of the important routes through the area. But whatever is done here will certainlt help Greater Anglia achieve their objective of three tph between London and Norwich in ninety minutes. Knowing the area well, I suspect that there will also be an enormous fight over if Network Rail decided to close the level crossing shown on the map. I looked at this in Are The Trains In Ely Finally To Be Sorted? Whatever is proposed here will not be just a few millions and probably very disruptive to implement, but it is essential to acommodate the planned extra services through the area. Upgrading this six miles of single track might appear to be easy across the flat lands of Cambridgeshire, but the line does include a couple of level crossings and a couple of bridges. This Google Map shows the ely end of the route at Ely Dock Junction. 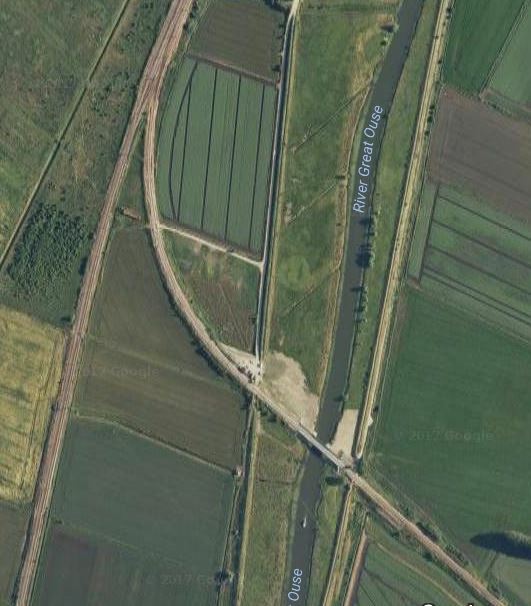 Note the single-track Hawk Bridge over the Great Ouse. Luckily, a freight train derailed on the original single-track bridge and virtually demolished it. The new bridge may be only single-track, but provision was made for a second track. A few times, I’ve passed Ely Dock Junction on a train or stood on the platform at Ely and seen a freight train waiting at the Dock Junction to pass through the spaghetti at Ely. Double-tracking would mean waiting freight trains wouldn’t delay Eastbound services on the Ipswich to Ely Line. But will a chord be built so services can go directly between Cambridge North station and the Ipswich line? 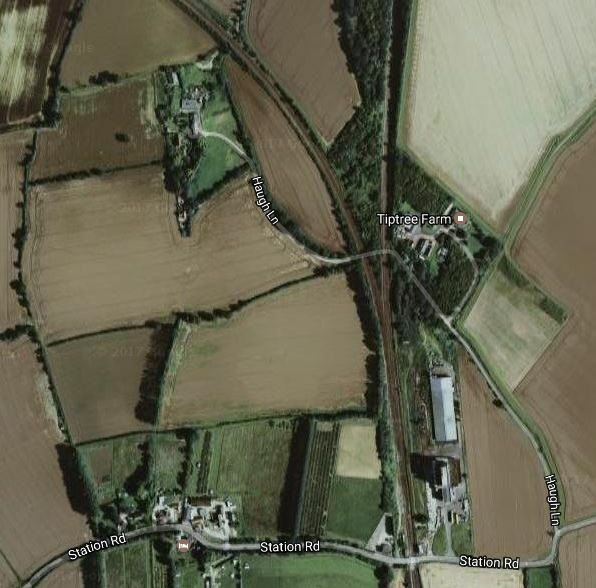 The Google Map shows the site of the original Soham station. Note that the line reverts back to double-track, just South of the former station site. So will doubling of line include provision for building a new station at Soham, as Cambridgeshire Council have proposed? You can certainly see, why Greater Anglia want this section of line to be doubled. The Trowse Swing Bridge is a major bottleneck on the Great vEastern Main Line, as not only does it restrict operations into Norwich station, but it makes access to Crown Point Depot difficult. It’s definitely the railway equivalent of having a single-lane section for both directions on a motorway. In Is This The Worst Bottleneck On The UK Rail Network?, I proposed the following under An Affordable Alternative. It has to be said, that perhaps the most affordable solution would be to build a stylish fixed link, probably with a double-track railway and foot and cycle bridges. As to the boat users, all boats that need to go under the bridge regularly would be modified so their masts could be lowered at no cost to their owners. Other bribes could be given to occasional users. There will be many bridges to cross, before Trowse bridge is replaced with a modern structure, more suited to a modern railway. Unless of course, the rusting and decrepit bridge decides to do the honourable thing and falls down of its own volition. It’s probably too much to hope, that a freight train derails on the bridge, as one fortunately did on the Hawk Bridge at Ely. Colchester station is not a station that would win awards for efficiency. This description of the platforms is from Wikipedia. The “up” (London-bound) side comprises two platforms, numbers 3 and 4, which have an unusual layout: 3 is on the up main line and is served by intercity trains from Norwich, while 4 is on the up branch line which merges with the up main line where the two platforms join end-to-end. The junction is protected by a trap leading to friction buffer stops. There are also bay platforms at both ends of the up main platform. The London-end bay (platform 6) is used for peak trains to and from London. Previously this platform was used for frequent services for the Sudbury Branch Line. However, most of these services were truncated to terminate at Marks Tey from the mid-1990s. The other bay platform (platform 5) is used for services to Colchester Town and Walton-on-the-Naze. The “down” side platform is an island platform with two faces, one on the down main, and one on the down branch line. Platform 1 is mainly used for Clacton-on-Sea trains and occasionally for Norwich trains. The new franchise has plans, that should make the station more efficient, but much busier. Norwich to London trains will have a frequency of three tph. A new one tph service will link Colchester and Peterborough, which would mean that Colchester to Stowmarket via Manningree and Ipswich would have a frequency of four tph. But the interesting idea is to extend the service between Sudbury and Marks Tey stations to Colchester Town station via Colchester. The service between Sudbury and Colchester Town could be two tph, as the trains could pass each other between Colchester and Marks Tey, if the track allowed. This Press Release from Network Rail is entitled More Reliable Railway For Essex As £100M+ Upgrade Is Completed. The last piece of the jigsaw included the commissioning of new ‘bi-directional’ signalling on the Great Eastern main line between Colchester and Marks Tey – meaning trains can now travel in both directions on both lines. This allows them to bypass problems should they occur and will improve flexibility and help reduce delays. I have just flown my helicopter over the junction at Marks Tey and it looks like there is a short loop line of about a kilometre on the South side of the main line, which is connected by a series of crossovers to the \Gainsborough Line. On the other side of the main line, there would also appear to be a connection between the two lines. So a train from Colchester Town could do the following. Travel to Colchester station on the Sunshine Coast Line. Stop in Platform 4 at Colchester station. Travel on the main line towards Marks Tey. Switch to the loop North of Marks Tey. Cross over the main lines and enter the Gainsborough Line to stop in Marks Tey station. Travel to Sudbury and back. After stopping at Marks Tey station return via the main line to Colchester and then on to Colchester Town. Currently, a train is scheduled to go from Colchester Town to Marks Tey in 13 minutes, with the round trip from Marks Tey to Sudbury taking about 45 minutes. If the service between Colchester Town and Sudbury was to be two tph, the Marks Tey to Sudbury round trip must be under thirty minutes, so that only one train is on the branch line at a time. The service is currently run using various trains like a Class 153 train, which have a top speed of 75 mph and acceleration to match, whereas the mosdern Class 170 train has a 100 mph capability. The Gainsborough Line also has a speed limit of just 50 mph. So I suspect, that with some judicious engineering on the branch and modern trains, that a thirty minute round trip is possible, thus making two tph on the Gainsborough Line a distinct possibility. All these service changes could simplify the pattern of trains through Colchester station. Most trains stop in the station and continue on their journey. Peterborough trains could use the bay platform 5 or a reversing siding to turn back. The bay platform 6 could be used as a terminus for trains from London as now. So will the tracks be arranged so that there is an avoiding line between the platforms just as there is at Ipswich station and used to be at Chelmsford station? The certainly would appear to be enough space. This picture illustrates the problems at Witham station. The freight train was going towards London and was slowly going through the station. The two lines in the middle are the two main lines, where trains generally stop. When the new Stadler and Aventra trains enter service in a couple of years, there will be more trains going through the station. At times, trains could be separated by just a few minutes. As these trains are designed expedite stops, I wouldn’t be surprised to see more trains doing a Touch-and-Go. This article on the EssexLive web site is entitled Witham loop could happen by 2024 with added faster trains to Liverpool Street. It says that the loop will be built North of Witham station and would allow faster trains to pass slower ones by 2024, but that Simon Burns MP will be pushing to have it built sooner. 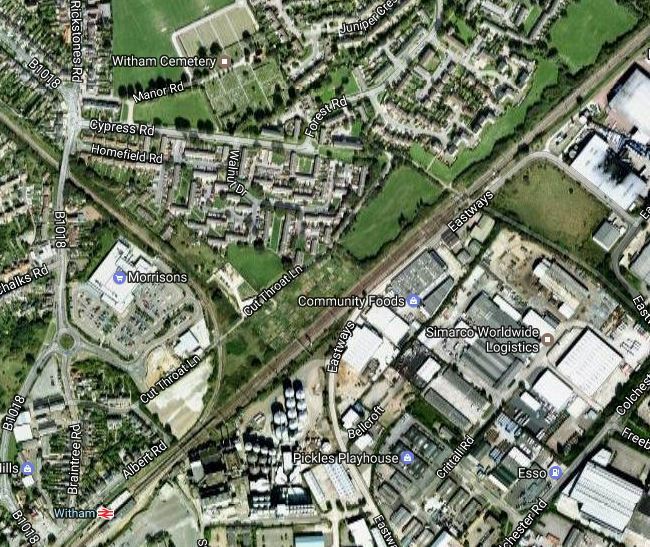 This Google Map shows Witham station and the line to the North. Note the Braintree Branch Line going off to the North-West. It does appear that there would be space for the necessary extra tracks to create passing loops North of Witham station. These would mean that passing wouldn’t have to be dome with the slower train blocking a slow platform. It certainly looks as if that both loops will be beneficial to all train operators and passengers. Given the following on the Great Eastern Main Line South of Colchester. Speeds of 100 mph and possibly more. The need to do very fast stops and maintain headway of a few minutes. The trains will be new. I suspect that digital signalling will be a necessity to maintain the required service frequency. There is certainly pressure for this service from the local Councils in the area. Would it include the preliminary works from the upgrade of Angel Road station? This is important both for Greater Anglia services to Stansted Airport and Cambridge and Crossrail 2. I wrote about this in Crossrail 2 ‘Cannot Go Ahead’ Without Four-Tracking Of West Anglia Line. But it will be a large and very disruptive project. I have been held up so many times by level crossing incidents, this can’t happen to soon. I thought that this was going to happen, as soon as the Crossrail trains go into the tunnels. Greater Anglia are not asking for the stars and it is a generally sensible wish list. Possibly the most expensive projects are the following. But some like the four-tracking of the West Anglia Main Line are not urgent, until Crossrail 2 gets an opening date.